Hip Hip Hooray!! We have won first prize for community vegetable garden in the Pennsylvania Horticultural Society's City Gardens Contest! The dedicated volunteers who have worked tirelessly from early spring through the hot days of summer are doing a victory dance and chanting "We're Number One!" Well, maybe we just have broad smiles on our faces. Gardeners tend to be more modest folks. What we are definitely doing right now is planning for next season. The garlic that was ordered two months ago from a mail order catalog will be arriving soon and to be planted next month. Successful plantings for this year have been noted, as well as those that were a bit disappointing. While this season has been the "year of beans", thought is being given to what vegetables to hightlight in 2014. Tomatoes seem to top the list. Crop rotation to avoid disease infestation is always a major consideration and challenge in a relatively small garden. Finding a different spot each season for the nightshade family plants (tomatoes and eggplants) can be tricky. The gardeners have also begun the necessary fall housecleaning. Some of the summer plants including many of the beans have finished producing and have been removed. Some fall crops have been planted and the battle with our four-legged friends has begun. The rabbits have feasted upon the peas and lettuces. The curly endive and arugula have been spared. Row covers over the broccoli, cabbage, collards and pak choi that were so effective in the spring, have done little to deter the hungry insects. Life is never perfect in the vegetable patch. 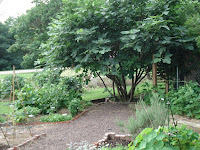 The fig tree this year has been amazingly bountiful producing well over fifty pounds of lucious fruit. All of the gardeners, the Horticultural Center staff, friends and families have enjoyed the harvest. The home canners in the group have jars and jars of fig jam in their pantries. 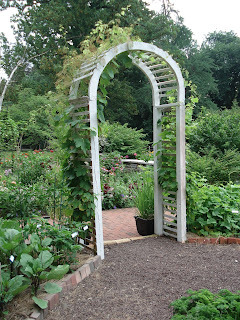 We have had numerous visitors to the garden, beyond the critters. Many folks have left messages at the sign in box --- "Thank you, thank you, what a beautiful oasis you created" --- and a personal favorite: "As good as Longwood". Kind words inspire us all!